Last week I spoke at an interesting conference hosted by Loughborough. It was to discuss their approach to operating model work – SOMS – standing for Service Operating Model Skills. Also speaking were two consultants from OEE, who have partnered Loughborough on the SOMS framework: Martin and Vishnu. This blog is about one slide that they showed which got me thinking. The slide was a version of this matrix from the Slack and Lewis text book “Operations Strategy” third edition 2011, Prentice Hall. The left side of this matrix is “Performance objectives” which leads to “market competitiveness” on the right side. 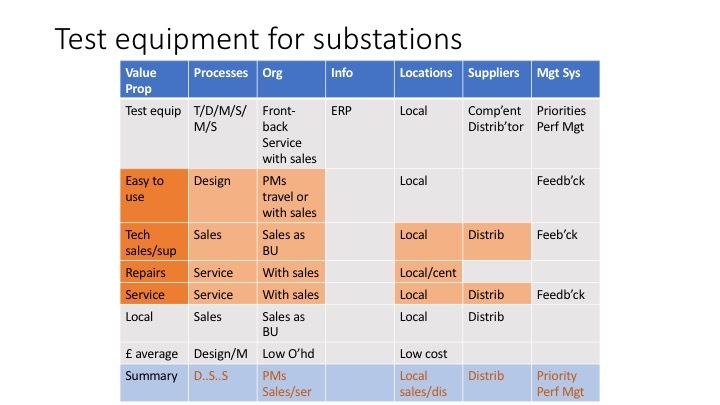 The bottom axis is operational “Decision areas” leading to “Resource usage” at the top of the matrix. 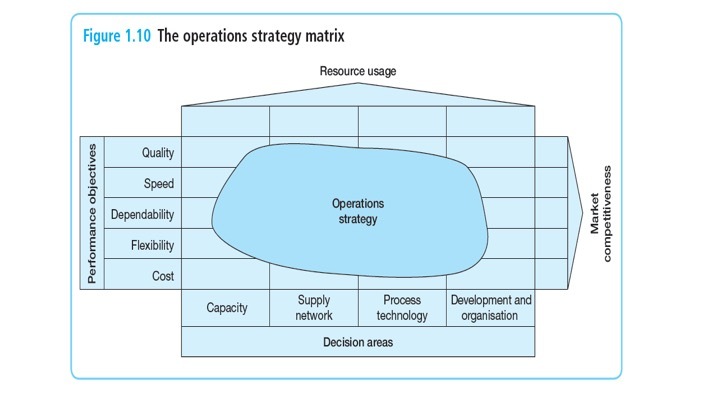 The boxes in the matrix are used to layout the main elements of the operations strategy or operating model. This matrix is familiar. But, for some reason, the way it was presented by Martin and Vishnu, using a case study of a bank, got me thinking in two ways. First, if instead of “Performance objectives” we use “Value proposition”, the matrix would have the same focus as the Operating Model Canvas. I will come back to this. Second, if instead of “capacity”, “supply network”, “process technology” and “development and organization”, we use POLISM – processes, organization, location, information, suppliers and management system – the matrix then has the same decision areas as the Operating Model Canvas. So the big thought going through my head: is the Operating Model Canvas, just a reinvention of the Slack/Lewis operations strategy matrix? The answer seems to be yes. So the next question: is the Operating Model Canvas superior and if so why? My conclusion is that one row should be devoted to describing the product/service: is it a piece of test equipment or a management course? The rest of the rows should describe the main features of the value proposition, particularly those that are expected to give advantage (the USP) (coloured in reddish orange). If POLISM is put along the top axis, the bottom axis can then be used to summarize the aspects of the “operations strategy” that are most important to each of the elements of POLISM: the words that you might expect to find on an Operating Model Canvas. If you have used the Operating Model Canvas tool, you will know that you should describe on the Canvas, (in addition to the value chains and the org chart) those aspects of operations that are most important to delivering the value propositions: exactly the same thought as the descriptions in the Slack/Lewis matrix. So the Slack/Lewis format allows a more fined grained presentation of the value proposition, and hence a more fine grained connection between the value proposition and POLISM. Worth thinking about. I will include it in my next course on Designing Operating Models and see how the participants like it. Of course the Slack/Lewis format has other weaknesses. It does not lay out the value chain. Hence my lettering in the top left box of the examples (my attempt to lay out a value chain in a very small space!) As a result, the Slack/Lewis format does not visually show that the OLISM parts of POLISM exist to help make the P of POLISM (the bit that creates the value proposition) work. But, as I keep repeating in this blog series, it is always worth understanding other people’s frameworks because most will have a dimension that is better than your own model. This entry was posted in OM frameworks, Operating Model Canvas, Value proposition and tagged Nigel Slack, OEE, Operations strategy, POLISM. Bookmark the permalink. There are many models and they tend to build upon each other. The one from Nigel Slack is very similar in nature to QFD or “The house of quality” although that one originated in product design it has performance criteria and various areas for cross comparison and scoring. Is your POLISM better or worse? in reality as long as whatever the tool used gets to the desired outcome, it probably doesn’t matter. The structure assists the logic and gives prompts to the thinking process and that is what is more important. As a business studies lecturer I see hundreds of models; it is not knowing the models themselves that gets the marks in the exam or assignment but the evaluation of the content of the frameworks that is really important point and that is a lesson to us all. Therefore it is what is written in the intersections of the matrix you describe that is the key value not using the tool. Yes David. It is what you put in at the intersections that is important. But, if you do not have a good set of intersections, you will miss some elements or give too much attention to other elements. For example, if your decision areas are “people, process and technology”, you are likely to give too little attention to location or supplier relationships or decision authorities or governance. If one of your decision areas is capacity, you may start working on the size of buildings or machines before you have clarity about some of the factors that will influence the capacity you need for the next period. All those creating models should be trying to create a MECE model – mutually exclusive and collectively exhaustive – that is easy to remember, visually powerful and practical to use. Slack and Lewis provide an interesting justification for their model using ratio analysis. Models should also be clear about the level of analysis at which the model is relevant. So I suggest that you include in your marking schemes, some marks for a student’s assessment of the model, in addition to the marks you give for the content the student places in the model. My blog was making an assessment of the Operating Model Canvas model stimulated by insights from the Slack/Lewis model. Conclusion, the Operating Model Canvas is possibly more MECE and probably more visually attractive and easy to use. Also it is more targeted at converting strategy into high-level operating decisions (Slack and Lewis point out that their approach combines top-down and bottom-up views, so is presumably aiming for a “medium-level”, which may explain some of the diffferences). 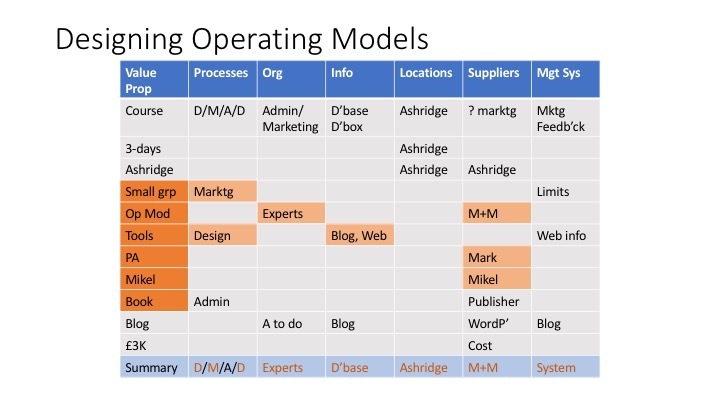 But the Operating Model Canvas provides less guidance on how to link value proposition with operating decisions (i.e. has fewer explicit horizontal rows and so fewer intersections), which is the bit that excites me – because it suggests an additional way to tighten the link between strategy and operations, my prime objective. Critical evaluation of models and analysis of their application is implicit in all grading grids at levels 5 and 6 (years 2 and 3 of an undergraduate degree) and map to the higher marks 60 (2,1) and above..
Andrew – interesting lines of thinking to explore and reflect upon! Thanks. a) It is helpful in using a two dimensional matrix, that each dimension is orthogonal to the other. Have you evaluated your dimensions from this perspective? b) In using any “model”, I am interested to understand how to test “completeness”. How do I know that POLISM is complete? Is there another characteristic that should be included? c) One of the “methods” that I use is to apply the Business Model and Operating Model fractally. So, for any element of the operating model, I would ask the next order question – what is the business model applicable to this element. This provides a simple, elegant method of elaboration with built-in integrity. Your questions are always interesting Peter. Let me try some quick responses. a) No formal evaluation. But I would be surprised if they are correlated in any way. b) The 64 thousand dollar question. All you can do is to keep checking against experience and other models to see if you have missed something important. There are plenty of candidates for additional or different labels. c) I also apply it fractally, but using the process steps as my fractal starting point. I think it is difficult to do a business model on a location or a part of a decision grid or a planning process – but maybe you can show me what I am missing. Clearly capabilities are treated in a fractal way. I now think that it is appropriate to do an operating model for each capability – the capability becomes the value proposition of the OMC … but this opens u a whole different dialogue. b) I think you can do more than keep checking. Yes, other frameworks may identify a critical element that has not been considered. But, there are other techniques that can be applied. For example, one dimension of any capability is the resources upon which it is reliant – finance, people, information, assets, consumables, etc. Consideration of the abstraction – resource:class – provides a test as to whether the class types are complete, and if so, how they are accommodated across your OMC dimensions. Another example, in the process / value proposition dimension is to consider the entity lifecycle – from cradle to grave – which provides a view as to whether your value stream is complete. c) Yes, we are taking a common approach. I only apply business model to each capability within my operating model. So it is process / capability based. Interesting approach! My 2 cents… value prop needs to be defined in customer outcomes vs. product benefits. If a customer is building a house and wants to feel creative and in control, but the value prop focuses on the hole that a drill makes, there’s a mismatch there. Frame value in customer language and needs, and it opens up a wealth of opportunities in terms of how you deliver on that promise. I think I agree with this Jennifer. But I have not had enough experience defining value propositions. Of course, in this context, you want the value proposition to give you guidance about how to design the operations, so there is a temptation to make it internally focused. Hence your guidance is probably much needed. Jennifer, If I take your thought to heart, I should change my VP definition for my course from “a course, 3-days, at Ashridge, on operating models, with a focus on tools, etc” to something like “help your colleagues improve your organization, advance your career and help speed up needed changes”. But, I am not sure this would be so useful in giving guidance for the operating model design. So I think you need a customer focused value proposition as guidance for designing a product/service focused value proposition which is then used to help guide the design of the operating model. So “help improve your organization” (customer focused) by attending “a 3-day course on operating models” (product focused). What do you think? Directionally, yes! Help the organization… do what? What’s the outcome that they’ll receive? It might be to achieve their goals faster and more efficiently? Or to personally feel more empowered and informed about how to do strategy? For B2B, there’s usually a company outcome and a personal outcome (since people make the decisions.) From there, yes, you’d support that promise with a set of features and benefits wrapped in an experience. a) I wonder if this opens up consideration of linking BMC, VPC and OMC – Business Model Canvas, Value Proposition Canvas, and Operating Model Canvas? b) Value is derived by the customer through use of the product / service. I explore this element of the dynamics through the business model, not the operating model, which are inter-related, as Andrew recognises in the OMC book. I couldn’t agree more with your comment. I am working with a current client on a new “Service.” I linked the three recognizing the same lynchpin (i.e., VP). It has really resonated with the client. The one modification I made was to have “front-stage” and “back stage” portions of a “Value Stream” = technically, I have used Value Stream for customer-facing activities and Key Activities for “back stage” processes that are not visible to the customer.